Preheat oven to 325 degrees F and grease a 12 cup muffin pan with baking spray. In a medium bowl, sift the first 6 ingredients. In a large bowl with an electric mixer, cream vegetable spread with sugar substitutes and vanilla. Blend in pumpkin, then the egg product. Turn mixer to low and gradually add in flour mixture until well blended (mixture will be thick). 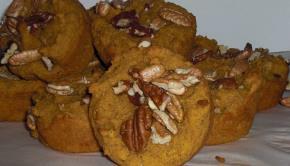 Spoon evenly into muffin cups, sprinkle with pecans and bake 25-30 minutes until a fork inserted into the middle of the muffins comes out clean. Cool for 10 minutes then remove from pan.